I’ve known so many people over the years who felt that way —— and certainly I would have to include myself. I guess I should not admit this to the entire world but the truth is– in the all the decades Bill and I have been married, it has only been in recent years that I have done – I feel – and excellent job of keeping our home “always presentable”. If I had to clean — say for an entire day — or even a half a day — even for 2 hours — I would immediately start dreading it. As with most things, the mental dread is worse than doing the work. Ok – I know – if you don’t have this problem — you are probably shaking your head in disgust. The good news is I have – I think – found the secret and it’s so simple that its easily overlooked. And I apply it to my garden and yard tasks as well. Next morning after showering and dressing I immediately do my 5 to 10 minutes of house cleaning. 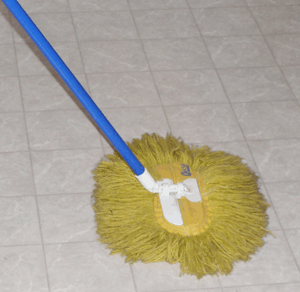 For example – I might use a dry dust mop (like the one below) on my kitchen floor to get up loose dirt and then continue to mop all my hardwood floors downstairs. This takes me 7 minutes total. Just the amount of time for cleaning that I can handle! And by the way, a feather duster is part of the secret and I think, one of the greatest things ever invented. You don’t have to move things like in normal dusting and it still gets clean. What a time saver! The process (of planning a specific task the night before and then spending a few minutes on it the next day) can be used in the garden. It is especially helpful on cold days during the winter or hot days during the summer when it is not very appealing to go outside. #1 – Plan the night before exactly what you want to get done. Be consistent and you’ll be amazed at what you can get done in such a small amount of time. I’ll be cheering you on! Have you ever heard of FLYlady? She has created a web-based community based on doing small amounts of housework (gardening works just as well) in 15 minute segments. I too have only in recent years been able to keep our home “company ready” most of the time, using these methods. When I make my morning foray into the garden, my timer is clipped to my apron. I work at whatever seems most needed for 15 minutes, then sit down and enjoy all that surrounds me for a nice 15 minute break. I have a glass of lemon water to sip on. If I have the time and feel up to it, I go back for as many 15 minute segments as I can. Usually I stop after 2, but this time of year it can be as many as 4. Although lots gets done, and it never gets out of hand, I don’t feel at all stressed or overwhelmed. Your site is lovely, your writing is very well done, and your photos are beautiful. We live in Central VA on a 6.5 acre property in the heart of a small city. Each year (since we moved here in 2006) we try to produce more of our own food, and preserve much of it as well. Reading your comment was a wonderful way to start my work day! I’m so glad you like the site. I sure appreciate your telling me so. I owe all the photographs to my husband. He’s an artist and thus he has a great eye for design. I love the chance to acknowledge his help. Your comment will be encouraging to others. I think if people realize how easy it can be to keep stress away by working a little at a time ———they can accomplish much more. How did you find my site Gail? I hope you will visit me often. Have a great day! Gail, I just checked out FLYlady! Bet that’s where you got your timer? When I go outside, particularly at this time of year, I feel overwhelmed by all the things crying out to be done – and done NOW!! Sometimes, the overwhelm (as you put it so well) just sets in, and especially if there are only 15 minutes or so out there, it just doesn’t seem possible to tackle ANYTHING. I often find myself thinking, “I need a whole day to myself in the garden – to get caught up!” That is NOT going to happen anytime soon, so I definitely need to take a moment tonight to prioritize and choose one task on which to focus. It’s even more valuable advice when the hazy, hot and humid weather comes, and it’s unpleasant to stay outside for long. I think most everyone can relate to exactly what you describe, Sandra. I know I can. I think if you apply my suggestions in the post you will be amazed at the difference in what you will accomplish. Just keep in mind — if you’re like me — you’ll have to fight overwhelm continually. But I must say — planning the night before and then focusing on what you know you’ve planned — is the best way to fight it. Good luck!